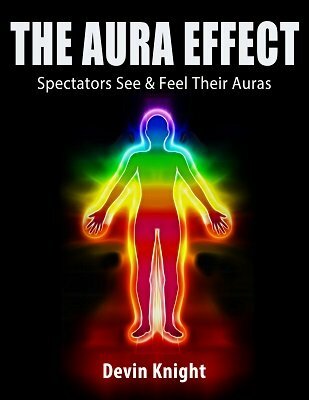 The Aura Effect revives several ancient ideas from the turn of the century and brings them into the modern day. These are ideas you will use. You can create the illusion that the spectators feel your aura. Magnetic Fingertips: This has been a staple in Devin Knight's career; it was also a favorite of the late Al Mann. The performer holds his fingers in front of a spectator's palm and the subject definitely feels an icy chill radiate from the performer's fingers. The performer claims this sensation is his aura. Two methods are explained. One method is completely impromptu and can be done on the fly. These techniques have been has been used by both psychics and mediums to allow the subjects to feel their psychic power. This is also being used by so-called healers, so the subjects can feel the healing power in their hands. Devin Knight often does this before bending a spoon, so the spectators can feel the psychic force. This can be repeated and is just as stunning the second time around. Long Distance Forces: A little-known method that allows the performer to stand 30 feet away and send bursts of energy to a subject. The subject feels sensations of warmth and cold though he is 30 feet away. This has been used by many faith healers, so the subject can apparently feel the healing power of God. Completely impromptu with no gimmicks. Can be done on the fly anywhere. This will leave people thinking you do possess strange powers. Few magicians and mentalists know this secret. Subjects See Their Auras: This technique has been in use since the turn of the century and is almost forgotten today. The psychic allows a person to look at her hand. The person sees her aura and the color it may be and tells the performer the color she sees. A cold reading can follow based on the color the spectator saw. This is clever bit of business that will make you stand out from the run-of-the-mill cold reader. Devin Knight uses this at psychic fairs to get more clients for cold readings. BONUS: This PDF comes with a cheat sheet that you can print. It has the meanings of all the colors with a very professional look. This means you do not have to try to memorize what all the colors mean. You can have the sheet on your table, have your subject see the color in her hand and tell you the color. She looks at the cheat sheets to see what the color means. You see it too, and start a cold reading based on the traits of the color. 1st edition 2015, 12 pages.